Hello Dominique, I am a bit less than a month away from my first ever 5k. I have asked you a few questions in the past. I started running a year and 80 pounds ago today. I am a 45 year old male. I average about 5 days a week on a short day I am running 3 to 4 miles on a long day 6 to 7 and have done as far as 8.5 recently. Can you please give me a good training schedule for the three weeks leading up to my 5K. I am getting so confused with the splits and all the other lingo I am reading about. I think I may be reading too much and giving myself mental overkill. I just need a common sense plan to prepare for this first race, one that gives me ample time to recover etc. I am not obsessed with time but would like to shoot for under 28 minutes. Thanks for any advice you can give. Thanks for your running training question. It sounds like you have made amazing progress over the last year. 80 pounds is a lot of weight to shift. You must be incredibly happy with that. And thanks for providing the extra background info, it does make it easier to provide a sensible answer. Five days of running is very solid and the distance you are covering is great for a first 5k. Generally for a first race I think it is good to not go out with a time goal. Having fun is way more important. A dedicated 5k running program would be a bit longer than 3 weeks (8-12 weeks). It is hard to get immense improvement in just 3 weeks, but I can give you some general guidelines. Now with regards to the intervals. It would be great if you did these at a pace faster than your 5k goal pace. E.g. 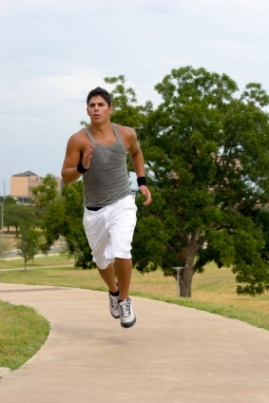 do 3-4 miles in which you alternate 3 minutes of easy running with 2 minutes of fast running. Also see my interval running page. With regards to the goal pace session: you could do a 4 mile session or so in which you alternate 1 mile easy with 1 mile goal pace. The goal of these sessions is to get a feel for what running at goal pace is like. Another idea for a goal pace session is on my goal pace running page. In case you had asked this question 3 months back I would have thrown in tempo running sessions as well, but given the short period and the nature of a 5k race I'd focus on running at goal pace and faster than goal pace. By the way, this will give you a good idea as well about the likelihood that you will be able to run this fast on race day. So, use these sessions as a guide as well, if you have a lot of trouble doing them then maybe adjust your time goal so your first race experience is a good one. In the last week I'd do one last fast session, e.g. 3 minutes easy, 2 minutes hard alternating. But make sure this last fast session is at the beginning of the week and is not too long (e.g. 3 miles is plenty). Assuming you would have had your long run on Sunday, do the interval session on Tuesday, giving your body 4-5 days time to recover until your race in the weekend. It is good though to still do that fast session in the last week as you do not want your legs to become stale and lose that speed. Other than that do some easy 20-30 minute runs in that last week to keep the legs fresh, without exhausting yourself. Best of luck and let me know how your race went! If you've been running for a year and you run that much each week - you should be able to do a 5K in your sleep!!! Dominique, I have been running the actual 5 K race route once a week with my wife who runs at a slower pace than I do. It has been hard for me to get a grasp on my own race pace. Today I ran it by myself and I hit 27.43. My goal has been to hit 28 or under. I know race day will be different but I feel pretty good and think I can most likely shave off some more time. Not quite "in my sleep" but I am getting there. The longer distances at slower paces seem to work the best for me. All though I felt pretty good after my run this morning. I had not broken a 9 minute mile except on the treadmill. I hover around 9.25 and 9.5. My first mile this morning was 8.53. The hill is in the second mile and it is not as bad as it used to be but is still quite a challenge. So I am moving along and getting closer to the goal. Not so much a problem running it as just not really sure what if any timing goals I should have and if so how to get to them. But thanks to Dominique and this site I am figuring it out. Looks like you'll smash that 28 minute goal time. If you are running 27:43 in a time trial, you should be faster in the real race. Unless of course there are thousands and thousands of participants, then you may face some congestion. Regarding pacing yourself: it is hard in the beginning, but gets easier with experience. An idea for the future is a GPS heart rate monitor. Very clever tools that help you keep track of your speed. Anyways, sounds like you have done all the right training for a good race.